Browsing for a reliable business cleaning service supplier? Then Better Cleaning Company is the sort of local reliable commercial cleaning company you want. 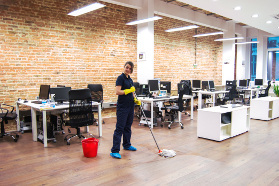 Our office cleaners always provide superior quality cleaning to all sorts of businesses in the area. For a quick and totally free price offer simply call 020 3746 3201 or send an online query below. The customer care employees will respond anytime of the day. Our company is a qualified cleansing provider in London and we have proven cleaning solutions to be highly efficient. All of them are environmentally friendly and harmless for you and your clients. We use Prochem cleaning liquids and all of our experts are insured. They will clean everything in your workplace. We provide a number of the local restaurants, eateries, shops, malls, supermarkets, department stores and various restaurants and retail businesses with regular and one off business cleaning services. We work in agreement to all safety and health treatments to make certain that your company premises are sanitary, safe for work and for your consumers, and can come in after working hours and on weekends, so that your work is not disrupted. If you want a trustworthy professional cleaners to keep your office premises thoroughly clean at all times, book our retail or restaurant cleaning services now! Speak to our customer care centre to ask for a session for our office cleaning services Acton Town W5 24/7. You can do that by calling our 020 3746 3201 or submitting an online request. We offer top quality, insured, cost-effective business cleaning services. We provide great regular cleaning contracts for local businesses. Reserve now and let us professionally clean your office now!